I hope 2019 is kind to you all and brings you health and happiness. I'm so excited to be sharing with you today my thoughts and opinions on the ION-Sei electric toothbrush. Needless to say, this is the most expensive toothbrush I have ever owned, retailing at £129.99 on Amazon, but it is different to other toothbrushes I have owned or even seen, as it actively uses ions to suppress bacterial growth in the mouth which causes plaque. This helps to reduce the risk of cavities in the mouth whilst also leaving teeth feeling super clean and smooth. 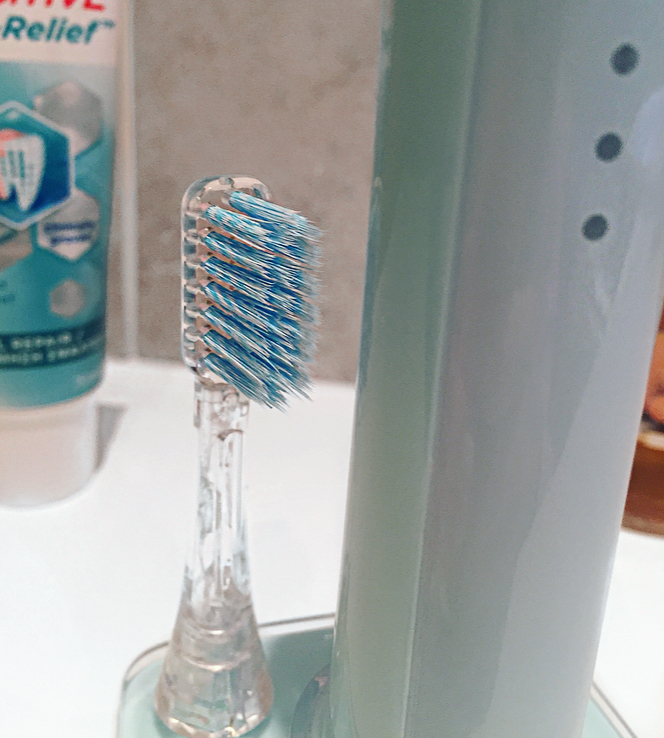 I'm not an expert behind the science of the ionic technology but in my understanding, this ION-Sei toothbrush contains a titanium dioxide rod and a UV LED which produces ions which are transmitted to the teeth in order to prevent bacterial growth and plaque. This means that teeth and gums will be healthier and hopefully this will reduce the risk of any cavities! I've been using this toothbrush every day, twice a day for two weeks and I've already noticed that my teeth feel smooth and polished, like I've just stepped out of the dentist, for a longer amount of time throughout the day, in comparison to my previous ORAL B electric toothbrush. The toothbrush comes with two brushes in the box, one standard and one soft brush. I personally prefer to use the soft brush head. It also comes with UK and EU plugs- perfect for travelling! The toothbrush comes with three modes: sensitive, standard and deep clean. This essentially adjusts the amount of vibration that the toothbrush provides. My setting of choice is standard for everyday use and deep clean on occasions. The three-tiered lights display what setting the toothbrush is on: either one, two or three LED's, which I find is helpful to know. In each mode, the vibration will briefly stop every 30 seconds which reminds you when to brush a different quarter of your mouth until the 2-minute timer stops. I really like this feature as it ensures that all parts of my mouth are clean. I do think that it is missing a pressure detector feature though, as considering the price of this, I would have expected an indication of whether you're brushing too hard like other toothbrushes have. One of my favourite things about this toothbrush is that it is USB rechargeable and a full charge takes between 3-4 hours and lasts for around 80 minutes- which is about 20 days if you brush twice a day! Overall this is a great toothbrush which offers an innovative design and method of brushing. I'd say that this toothbrush is much quieter than my previous ORAL-B electric toothbrush and definitely much lighter to hold. One of my favourite features of this toothbrush is its modern and sleek design. It looks great in my bathroom and is unique to anything I have ever seen before. 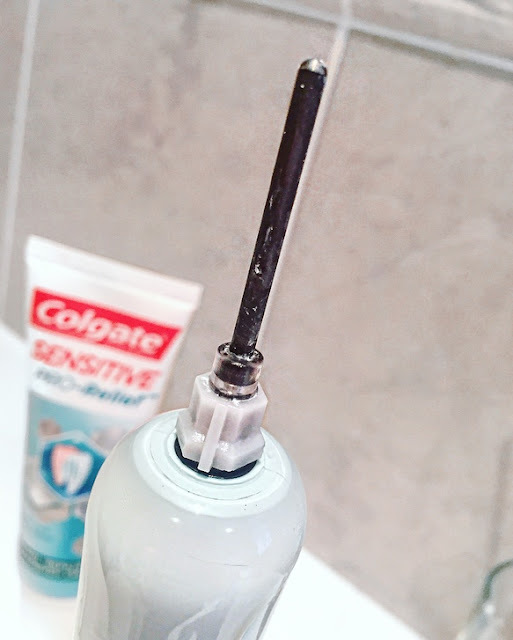 The only two downsides to this toothbrush are that a) I do miss the rotary brush head which my previous toothbrush had, as this one is sonic and b) that the toothbrush itself and the replacement brush heads are very expensive at £129.99 for the toothbrush and £11.99 for a two-pack of replacement brush heads. I'm Vicky, a beauty, lifestyle and a bit of everything else blogger from the North West of England.